Springtails (Order Collembola) are considered to be primitive, tiny, wingless hexapods (having six legs) that some consider are true insects but others believe that they are simply insect-like arthropods. Springtails get their common name because most have a forked structure on the tip of the abdomen, which can be used to jump or spring into the air. Springtails tend to thrive in humid environments where they are often very numerous. They are commonly found among wet leaves, within soil and mulch, and under rocks and logs. When outdoor conditions are unfavorable (i.e., hot and dry), springtails may enter the home, seeking out basements, bathrooms and other moist areas of the house. Some species of springtails are semi-aquatic in habits and they may cause alarm to homeowners when seen in large numbers along sidewalks and driveways, or on mud puddle surfaces, etc. They can often build up large numbers around above-ground pools where water may be saturating the soil. In wet basements, they have been known to cover walls that have mold growths. They are usually most apparent in the moist periods of spring and early summer, but they can be found year-round. Some are known as "snow fleas," appearing on the top of snow during late winter and early spring. These very small, jumping insects do not bite humans, nor do they spread disease or damage household furnishings. In rural areas, they can end up in well or spring water. This is because some species feed on the bacterial and algal scum that can coat the well surface or where spring water emerges. While these insects are typically only a nuisance, some species may feed on the stems and roots of young seedlings, resulting in wilting or even death. Springtails are minute insects, usually 1–3 mm in length. As a result of their size, they are seldom observed unless their populations build up. Colors vary from white, gray, yellow, orange, metallic green, lavender to red with some being patterned or mottled. Most are elongate or globular in shape, with a hump-backed appearance. Their mouthparts are attached inside the head capsule, which differentiates them from most other orders of insects where the mouthparts are attached to the sides of the head capsule. Most springtails are able to catapult themselves (leap) through the air by means of a tail-like mechanism (furcula) tucked under their abdomen. When disturbed, this appendage functions as a spring, propelling them into the air away from danger. Young springtails resemble the adults except for size and color. Adults may continue to shed their exoskeletons (molt), which is not the norm for most true insects. Springtails occur in nearly every climatic condition throughout the world, such as in high mountain regions, pools, streams, snow-covered fields, forest floors, etc. They live in soil, leaf mold, under bark, in decaying logs, on the surface of pools, in organic mulches, in termite nests, in greenhouses, in mushroom cellars, etc. Populations can reach numbers that are up to 100,000 individuals per cubic meter of surface soil, or many millions per acre. Most feed on algae, fungi and decaying vegetable matter and they are abundant only in damp, moist or very humid locations. Others feed on plant roots or nibble on young plant leaves and germinating seeds in hotbeds. They are considered beneficial because they are decomposers (they are good recyclers). For example, they are among the few organisms known to break down the insecticide DDT in the soil. Some can reproduce at temperatures as low as 40°F. They move by crawling or jumping, followed by periods of rest. Sometimes they may become a pest by their presence when very abundant, and by entering homes through doorways, screens or other openings. Buildings with constant high humidity may be overrun with springtails. Springtails are commonly found where there are sources of moisture. Outside the home, avoid excessive layers of mulch (2–3 inch depth is recommended), remove leaf or plant litter, reduce irrigation frequency, prune shrubbery to improve light penetration to the soil, and avoid dense ground covers. Check and correct any downspouts that may be depositing water around the house foundation and prune back plants to permit proper air circulation next to the building walls. If outside swimming or play pools are used, keep as far away from the house as possible and regularly check for leaks. Inside the home, use any means to increase ventilation and remove excessive air moisture. Use fans and/or dehumidifiers. Regularly check and repair plumbing leaks, and wrap and insulate pipes or air-conditioning shafts where water may be condensing. 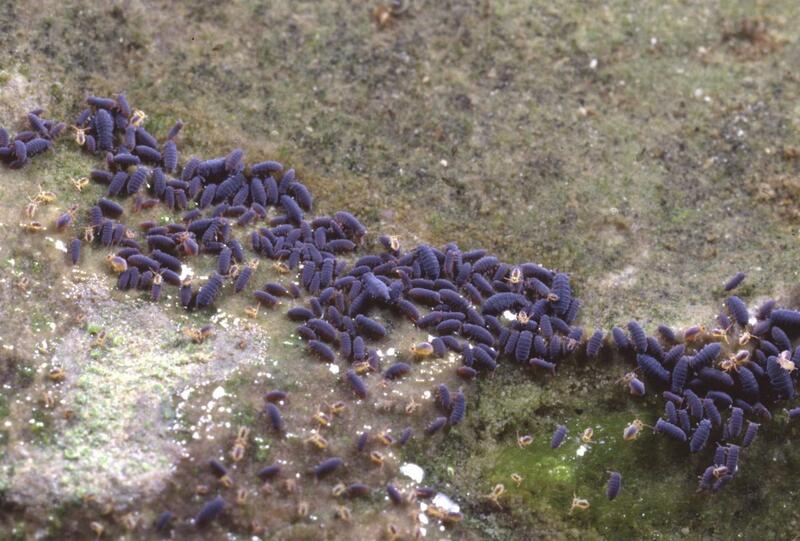 Indoor plants that have been set out during the summer can become infested with springtails. Avoid over-watering potted house plants and allow the soil to dry between watering. Use caulk to seal cracks and crevices around door and window frames. Control with pesticides is generally not required if moisture management is followed. Where moisture or outside environmental conditions cannot be easily managed, perimeter treatments with residual insecticides (granules or spray) are often used to discourage springtails from moving into a structure. These treatments are applied as a band that start at the building foundation and extends a foot or more into the surrounding landscape. Be sure to select pesticides that are specifically labeled for this purpose. 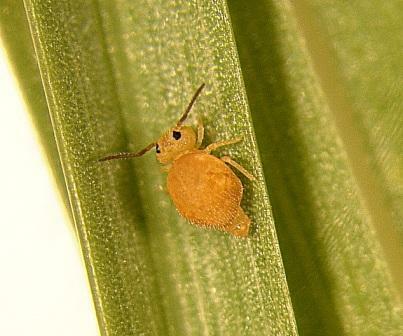 Inside buildings, aerosol "creeping and crawling" pest control materials can be used to provide some short-term knockdown of springtail populations. Total release aerosol (so-called bug bombs) are not recommended because these products rarely get into the cracks and crevices where springtails may be hiding. This fact sheet is a revision of HYG-2070.